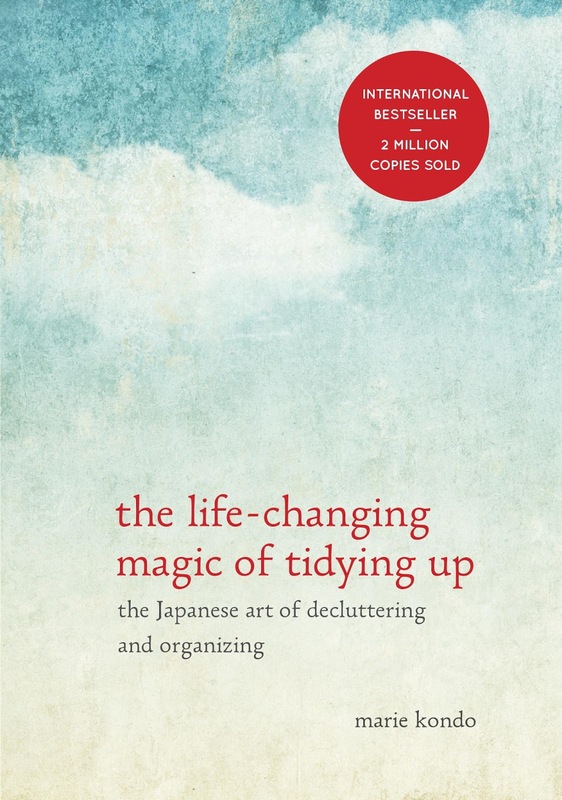 I, like seemingly every other home decor blogger, recently read Marie Kondo's The Life-Changing Magic of Tidying Up. I actually didn't read it so much as borrow the audiobook from the library and go for a long run, while being lectured about my improper sock folding technique. 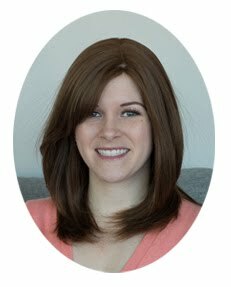 The whole idea is about purging the items that clutter your life and focus on surrounding yourself with things that make you happy, and then treating those items with respect at all times- which means actually thanking them out loud for being a part of your life and caring for them like a friend. I don't know if I am going to start blessing my dish sponge at dinner, but I did use her ideas to revolutionize my closets and dresser. First, I threw every piece of clothing I owned onto my bed. It is important to physically pick up each item to decide if you want to keep it, so this step is key. Then I went through item by item and asked myself if that item sparked joy. I actually ended up "tossing" (aka going to give away to friends or sell) and entire garbage bag of clothes! I now only use one of my closets instead of both! And, just to mention, the top shelf in this closet is Cam's sweaters and my overnight bag. I used to have both of my closets crammed with hangers and folded clothing! The other closet I gave over to Cam to store his cabinets. 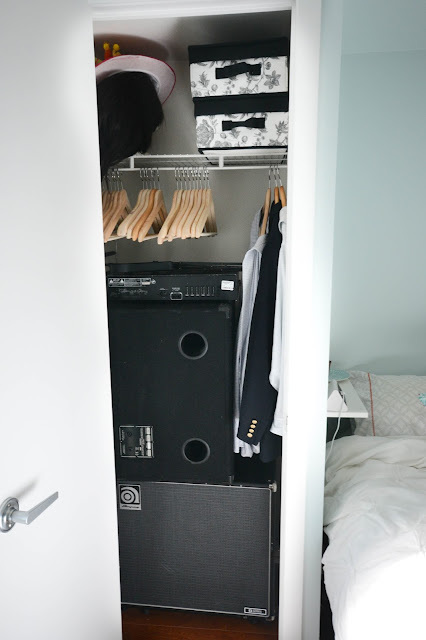 Dating a musician seems to come hand in hand with a lot of bulky music gear in your house so I am more than happy to find closet space for it. All those hangers in here used to store my clothing! 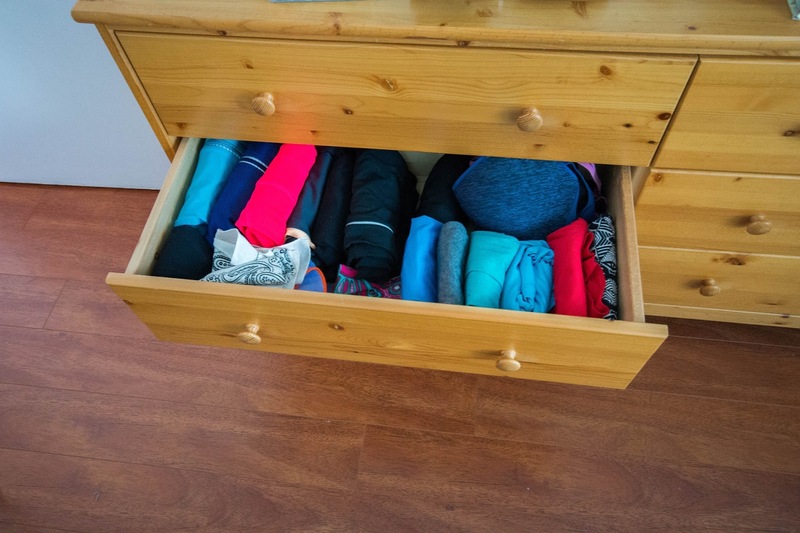 The KonMari method also has very specific ways to hang your clothing up, but I just did my normal way of tank tops to dresses (which I think was kind of similar to her method, if I recall correctly). 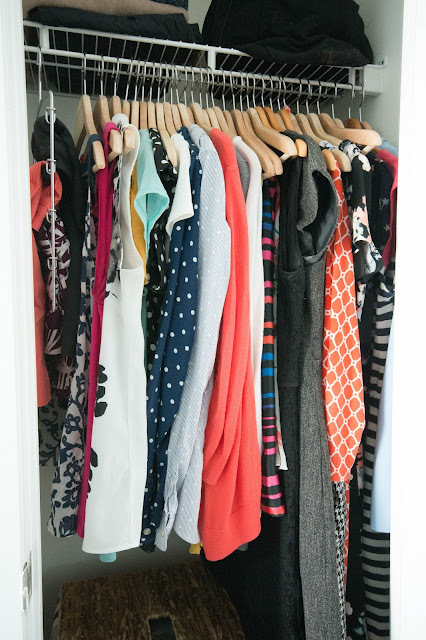 I have skirts on a pants-type multi hanger on the left, then flowy tanks, then dress t-shirts, then button downs, cardigans, work dresses, casual dresses, and blazers. I find this method is way easier than sorting by colour. 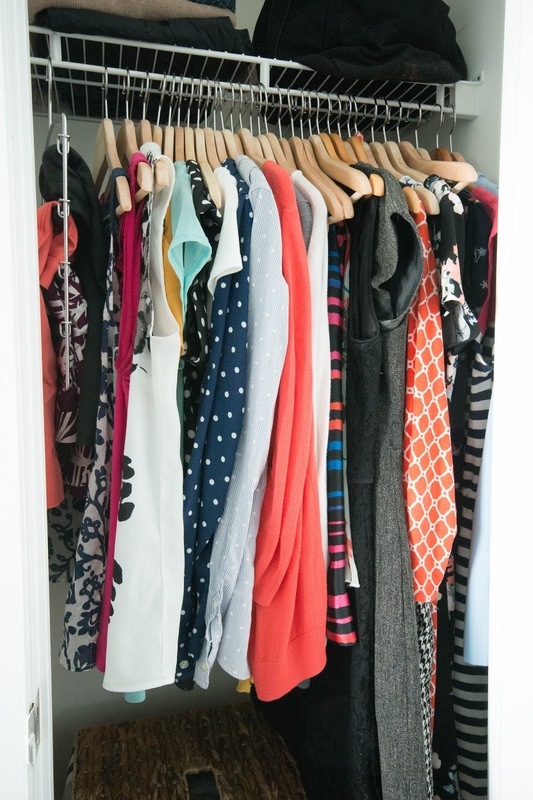 For instance, if I want to wear my navy dress and it is cool out, I will want a cardigan, so I can easily find all mine and then decide which will go best with my dress. 3. It fits a lot more stuff! She also claims this will deter wrinkles because stuff won't get pushed around or have the weight of other items on it. I think the only rule I didn't follow was folding all my socks instead of balling them ("like potatoes", as Marie would say). I tried folding, but the little ankle socks were having none of it and I gave up. She recommends everyone start with clothing, as it is the easiest, and then keep working in categories. I think after clothing was books, then all papers in your home, and then all miscellaneous stuff like knick knacks, and then all sentimental items. 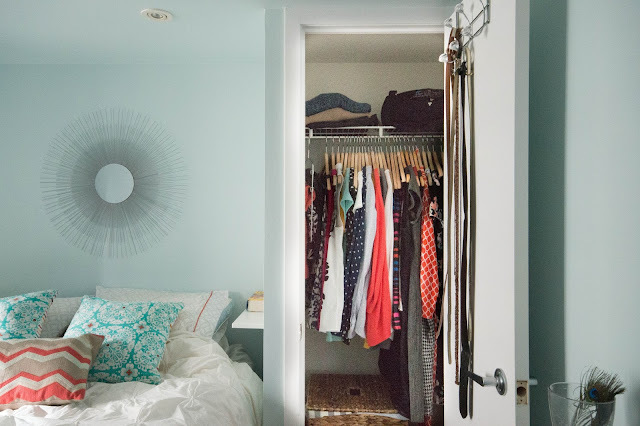 She completely disagrees with tackling one room at a time; you should tackle one category at a time, going all over your home to collect the items in that category and carefully sorting through them. I don't know if I am ever going to get around to purging the rest of my stuff, but so far I am loving my new clothing situation. All my clothes are so easy to find, everything left is stuff I actually like to wear, and it is such a breeze to get ready in the morning! Wow, so impressive! I keep going through my clothes and not actually getting rid of much. I feel like I "need" it all. Maybe you should come to my house and help me purge! 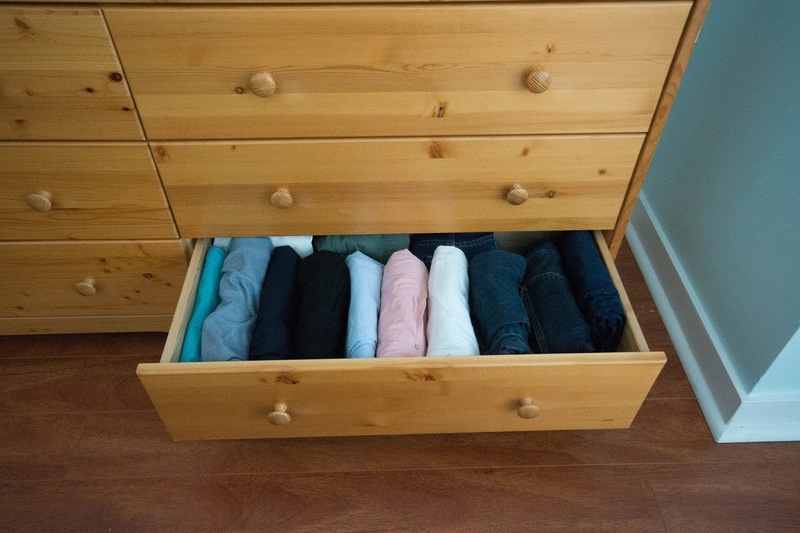 I used the KonMari method for the baby clothes and it was a total game changer. 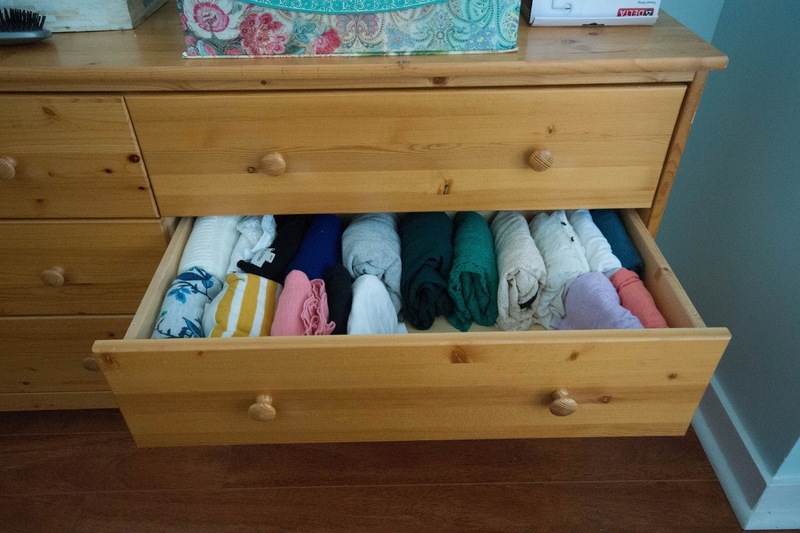 The drawers were bursting with clothes before and now they're only about 3/4 full. Half- Marathon Training: Week 2 Recap!